I've had these cola bottle sweets (dare I admit it) for almost a year. I picked it up when I was in Nairn last year. Every time my nephew has come up, he has asked if he could eat them. I've told him no, these were a lot most pricey than those fizzy cola bottles in the High Street. You see these do not contain animal gelatin making them suitable for vegetarians and vegans. He asked again could he eat them and why not they've been sitting there for a year?! He was right. I reminded myself why I had bought them in the first place. Despite having fond memories of eating the fizzy cola bottles as a child, these were not purchased to remind me of the good old days. These were purchased to decorate a Chocolate Cola Muffins when the opportunity presented itself. 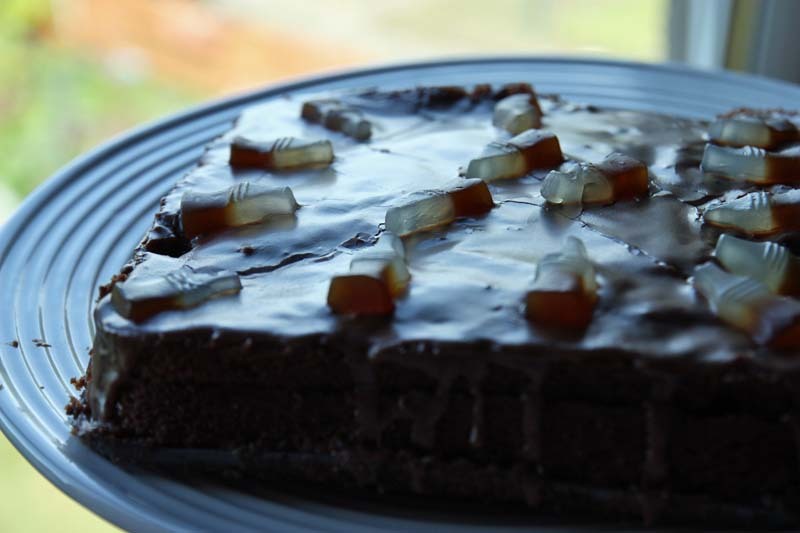 He then asked if I would make him the 'Chocolate Cola Cake' and I was instantly reminded of the last time I made it for him. The cake batter all leaked out because the cake tin was warped. I suddenly felt all guilty and agreed to make him another Chocolate Cola Cake, as well as promptly use the cola bottles that were surprisingly still in date. 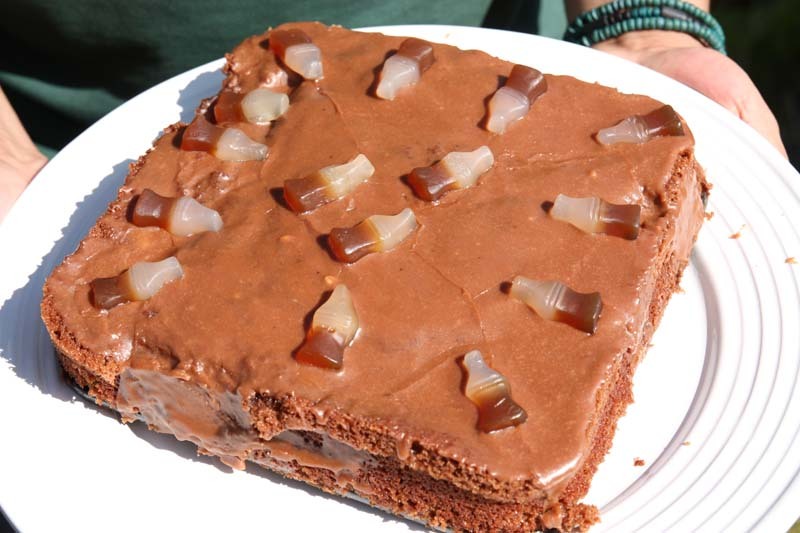 The cake does not disappoint, it is sweet and moist and the cola is very subtle. I especially liked the icy chocolate sauce that sets on the top. Something about this cake reminded me of those you find at school fairs or charity fundraising events - it was homely - nothing fancy about it at all, well not my version anyway. And as children do (and some adults) whenever either one of us walked past the cake, one of the cola bottles would disappear - naughty I know! This particular cake comes from Nigella Lawson's How to be a Domestic Goddess. I deliberately haven't posted the recipe on my blog as you can find the original, plus variations of it on blogosphere. I am linking this recipe to Tasty Tuesday Party hosted by Nap Time Creations; and Tasty Tuesdays hosted by Balancing Beauty and Bedlam. Looks delicious & those coke bottles make me smile! I too have good memories of those fun wax bottles. I do enjoy a good Nigella recipe. Thanks for this fun post. Good to hear from you. I'm guilty too of not ocming by, sure will in a little while. Thank you to you too Zaylyn. It certainly was with the sweetie cola bottles.